Please join us at Michelin Star Junoon for a four course spirited dinner pairing prepared by Chef Akshay Bhardwaj and where whisky innovator and Assistant Distiller Ashok Chokalingam will share stories, insights and education. What kind of person does it take to convince the Scots that there might be a whisky other than Scotch worthy of their time proven taste buds? And that this whisky might come from a former colony known more for spirituality than fine spirits? A man with no prior proven record in the whisky or even the liquor business. One willing to clock 300,000 solo miles on the road in the UK, wearing out two cars, a Vauxhall Astra, a Ford Mondeo and nearly a third, a Mercedes-Benz in order to convince this whisky nation that there is a place for world whiskies when nary a market existed anywhere. Well it takes a mighty determined guy born in Tamil Nadu, India, schooled as a Mechanical Engineer in the UK, armed with only a dissertation on the viability of Indian Single Malt Whisky from the son of the distillery owner to start pounding the pavement in Newcastle upon Tyne, UK and end up conquering 42 countries worldwide in just 12 years. That man is Ashok Chokalingam and is now a well-known and widely respected personality in the global whisky industry. In 2012 and again in 2016 he was recognized for his perseverance and contributions to the world of Whisky by industry peers as the ‘Icons of Whisky’ - World Whisky Ambassador - Whisky Magazine, UK. Launched in the USA in 2010, Amrut Indian Single Malt Whisky has firmly captured the hearts of American single malt whisky aficionados. The now established success of Amrut Indian Single Malt Whiskies in over 42 countries is widely credited to Ashok's years of determined global travel. As the original Indian whisky missionary Ashok established the brand between 2004 and 2008 by clocking nearly 300,000 miles on the road in the UK alone, wearing out 3 cars in his travels. After which as an established and widely respected whisky expert Ashok travelled the globe in his words, "preaching and teaching” both industry professionals and whisky aficionados on the ways of Indian Single Malt Whisky. In recent years Ashok has travelled less, allowing him to work as the assistant to Master Distiller Surrinder Kumar on the production of single malts where he has long had input into the development of many of the exclusive and special single malt offerings the distillery has innovated, such as the widely coveted Spectrum. 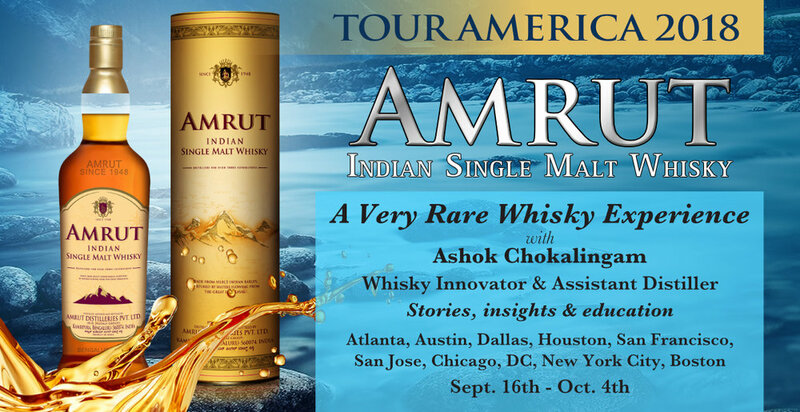 In a now, rare public appearance the man who helped put Indian Single Malt Whisky on the map, will celebrate America’s love for Amrut Whisky and lead entertaining and insightful events across 10 cities including: Atlanta, Austin, Dallas, Houston, San Francisco, San Jose, Chicago, Washington DC, New York City and Boston. Started in 1948 the Amrut Distillery located in Bangalore India was the first Indian distillery to distill a world-class single malt whisky produced according to the Scottish Whisky Association regulations. Amrut began producing single malt whisky in 2004 but it was a tough story until 2010 when malt guru Jim Murray stunned the world giving Amrut Fusion an unprecedented 97 point score, making it the 3rd highest rated whisky in the world in his Whisky Bible. In 2011 Amrut was named “Distillery of the Year” - Icons of Whisky further recognizing its impact on the changing world of Single Malt Whiskies. Accolades for Amrut include: World Whisky of The Year (twice), Brand Innovator of The Year and Malt Maniac's Daily Dram of The Year. Amruts' venture into single malt whisky started as a thought in 2001 when Amrut Distillery Chairman Neelakanta Jagdale asked his son Rakshit Jagdale and his academic peer Ashok Chokalingam both having become friends at Newcastle University in the UK, to develop a thesis on the viability of an Indian distilled single malt whisky. Amrut Distillery based in Bangaluru, the Silicon Valley of India, employs over 1000 people, with more than 30% being women who are major contributors in supporting their families. The distillery now adheres to strict local environmental standards, some of the strictest environmental standards demanded of any distillery in the world. The success of Amrut will see its second distillery open in 2018 along-side the original.